LOS ANGELES, California, January 6, 2013 (ENS) – Hydraulic fracturing, known colloquially as fracking, is a contentious issue, and Hollywood has not overlooked it. “Promised Land,” directed by Gus Van Sant and starring Matt Damon, takes on fracking, which involves blasting millions of gallons of water, sand, and chemicals into rock, often shale, in order to extract the oil and natural gas within the formations. Critics argue that the process wastes colossal amounts of water; contaminates air, soil, and drinking water; and may be implicated in causing earthquakes. The screenplay, written by Matt Damon and John Krasinski, is based on a story by Dave Eggers. It’s a decidedly mixed bag. 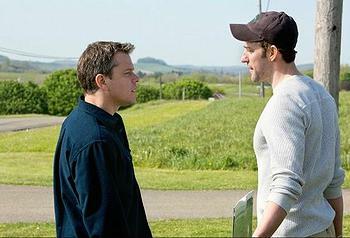 In “Promised Land,” Steve Butler (Matt Damon) is a salesman, who – along with his colleague Sue Thomason (Frances McDormand) – travels to rural Pennsylvania. He sees fracking as a chance to help struggling farmers. Working for Global Crosspower Solutions, they sign lucrative leases. The farmers earn money by leasing their farmland, while Global earns by extracting its resources. Having grown up in rural Iowa, where his grandfather owned a farm, Steve knows first-hand the struggle of farmers, so sees no issues with his mission at first. All the arguments from “can’t survive on federal farm subsidies” to “it will fund the rising cost of a college education” are included in the sales pitch and made in quick succession. As in real life, heated debates among the area residents ensue. The farmers, who are struggling financially, are tempted to take the badly needed monies to make ends meet. Yet Frank Yates (Hal Holbrook), a science teacher at the local high school, expresses concerns at a town meeting about the long-term effects of hydraulic fracturing on the region, its soil, water, and air, and consequently on livestock and residents’ health. And then Dustin Noble (John Krasinski), an environmentalist, arrives in town, expressing just these and other concerns, too. Who will pay for the clean up that might be needed, once the resources are depleted and the company moves on? The company? The state? The local coffers? Who will pay for any adverse effects on health that might be incurred? Who will replace the lost jobs that the boom and bust economic wave might unleash? A one-man organizer, he goes farm to farm, talking to the residents and putting up signs in their front lawns that read “Global Go Home” and are adorned with images of dead cows. “Promised Land” complicates what could be a simplistically rendered battle between outside salesmen seeking to profit from struggling local farmers by presenting the fissures within each group: the differing opinions among the farmers about the best course of action, and the conflicted viewpoint of Steve Butler. In “Promised Land,” the decision about whether or not to allow fracking is ultimately brought to the town for a vote. In the real world, debate exists about whether fracking should be regulated at the federal, state, or local level. Numerous towns and cities nationwide have passed local bans. Both New York and Maryland have suspended fracking in order to assess its environmental and health impacts. Unfortunately, the film leaves Steve’s moral education up to local high school teacher Alice (Rosemate DeWitt) and science teacher Frank, who used to be a scientist. Alice once lived in Manhattan but moved back to her grandfather’s farm because when it came time to give up the property, she “did not want to be that person.” Now, she brings students to visit the garden in the backyard, so that they “learn how to take care of things.” It’s a line she gives Steve when he first tours the yard and one he cites during his last speech. The implicit narrative: Leave it to the women and elderly to be the moral compass that (may) educate men and have them realize a sense of ethics. And teachers are mainly people who have been successful elsewhere rather than choosing the profession for its own merits. Yawn. Also disconcerting is the fact that the environmentalist comes from outside the community rather than from within the community. This distorts the broad base and local roots of the real world anti-fracking movement. The clichéd depictions of non-urban spaces as all alike smack of bi-coastal unfamiliarity and may rub audiences the wrong way. The film quips “two hours outside any city looks like Kentucky.” In fact, as anyone who has ever driven through Kentucky and Pennsylvania knows, the two are not the same, in vegetation, in people’s demeanor, or in shale deposits. “Promised Land” offers superb acting and beautifully shot landscapes, but it offers a rather superficial take on fracking and clichéd images of rural residents. The film opened in select cities on Friday, December 28, making it an Oscar contender, and opened nationwide on January 4, 2013. Click here to find a theater near you.